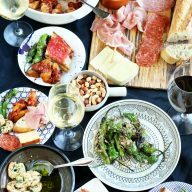 I’m throwing it back to the early days of my blog, when I first started getting back into cooking. I remember trying this tostada from How Sweet It Is and basically losing my mind. Honestly, that was the first tostada I’d ever tried (not a bad intro at all! ), and every since it’s what I go to when I’m feeling a little less than creative. They just happen to be the one thing I can always create something new out of. Like a blank canvas of crunchy awesomeness. Why the creativity block you ask (or maybe you aren’t asking, but I’m telling anyway…)? One word – moving. Did you know that moving is completely stressful and overwhelming no matter how much help you have? Because it is. I am waking up in the middle of the night thinking about packing up food props instead of thinking about the food I’d love to make. Those are my prime creative hours and they are being stolen by a sense of dread for all the paper and boxes I will be destroying with a room full of dishes, platters, utensils and linens! GAH. I wish I could say my recent attempt to pick up running again is helping me clear my head, but instead I’m reminded of how horrible I am at running. 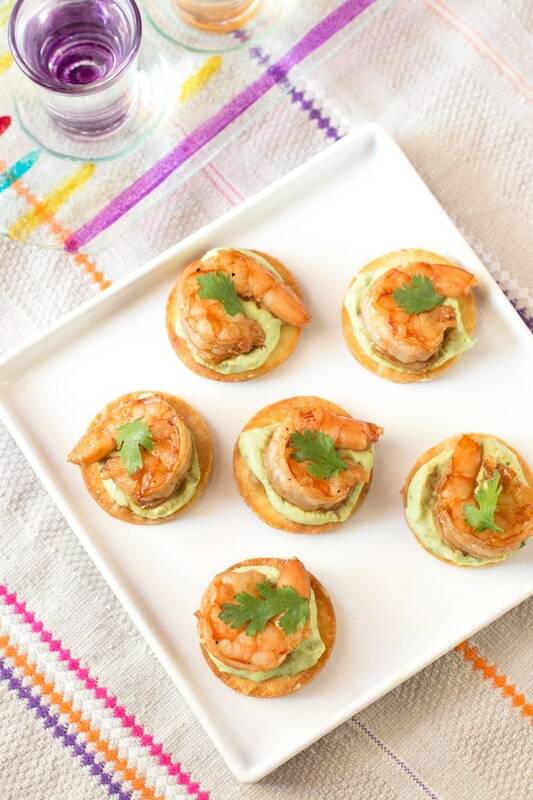 These spicy shrimp tostada bites are going to be your new go-to favorite snack/appetizer/midnight snack. 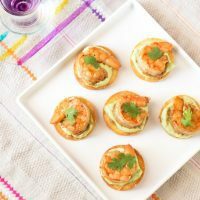 They have just the right amount of spice to give the shrimp a nice kick, and then you can cool down with the avocado crema all in the same bite. Despite a serious writer’s cooker’s (?) block, the comfort of tostadas and all things spicy and avocado will always prevail. 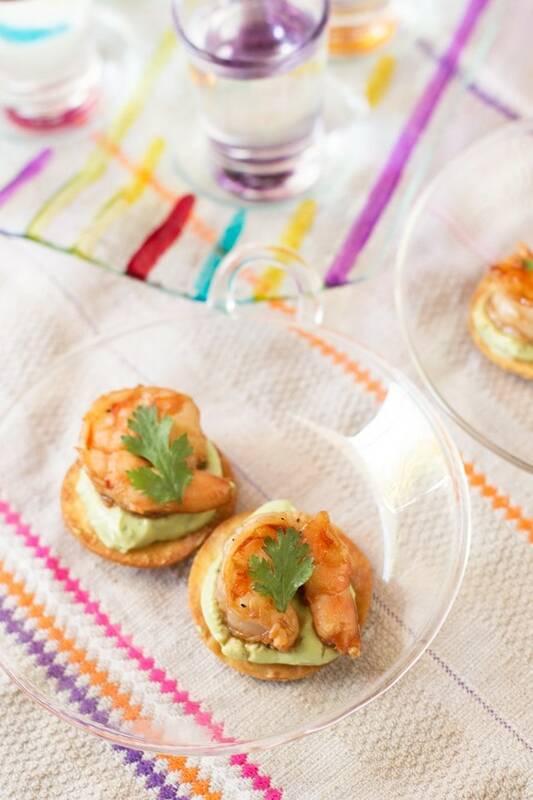 Spicy marinaded shrimp are the perfect topping for these mini tostadas, topped with a cooling avocado crema. In a small bowl, combine garlic, soy sauce, Sriracha, 1 Tbsp lime juice and agave. Stir to combine. Add the shrimp and toss to coat. Allow the shrimp to marinade for at least 30 minutes before cooking. Pour enough oil in a skillet to reach approximately 1/2-inch to 1-inch deep. Heat over medium-high heat. Once the oil is hot, fry the tortilla rounds in batches of 5 or so, depending on the size of your pan. Make sure you don’t overcrowd the pan. Fry the rounds for approximately 15 to 20 seconds per side, until golden. Remove to a paper towel-lined plate and season with salt. Set aside. 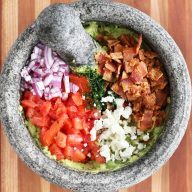 In the bowl of a food processor or blender, combine avocado, sour cream, juice of 1/2 lime, cilantro, 1/2 tsp salt and pepper. Puree until smooth. Set aside. Heat a medium skillet over medium heat. Remove the shrimp from the marinade and cook until pink and cooked through, approximately 30 seconds per side. To assemble the mini tostadas, spread each round with approximately 1 to 2 tsp of avocado crema. 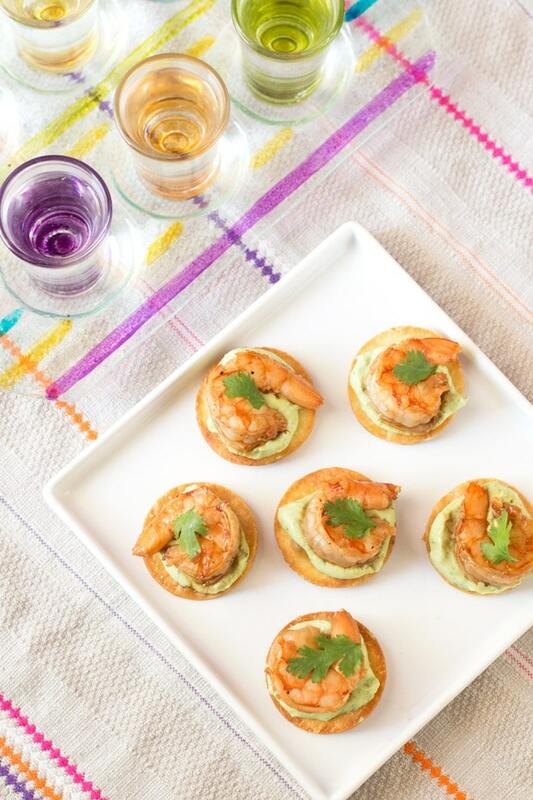 Top each with one cooked shrimp and garnish with cilantro leaves. Serve warm. 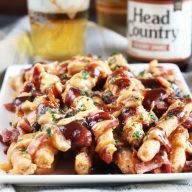 I’d love to snack on these! Yum! Are you making a big move? Onward and upward, I hope!